Happy Bloggers Challenge Friday! Thanks to those who played along with last weeks Oh Baby Challenge. 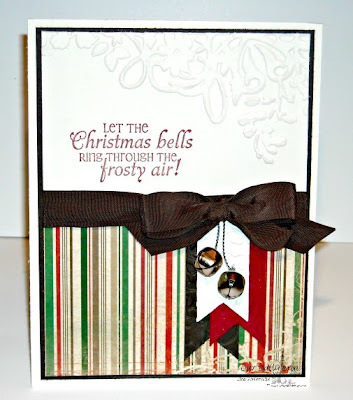 This weeks Challenge theme is To Die For - use Dies or an Electronic Die Cutting Machine to create your project! If you stopped by last week, then you know that my Big Shot it out of commission, now I could have created a project using my Silhouette, but instead, I opted to "recycle" some pieces I had in my die cut/embossed pile of things, and used a stamp set that was still out on my desk. The end result a CAS Holiday card. I'm hoping the replacement parts arrive this weekend! The Fish Tale pieces had been cut with the Silhouette Cameo, I embossed them with the Alterations Folder to match the embossing on the Vanilla panel. 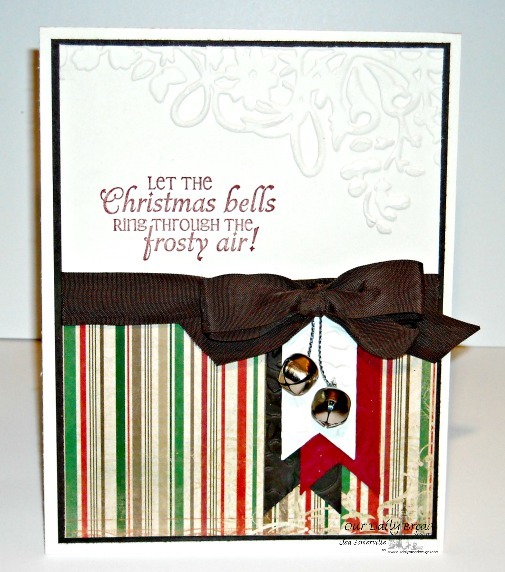 The sentiment is from Our Daily Bread Designs Jingle Bells stamp set, stamped in Cherry Cobbler. Great Christmas card meeting the challenge! Your card is beautiful and elegant. Thank you so much for posting this challenge for us. So festive and pretty! Love the little bell embellishments.